NordBeat's Jukebox the All-In-One-Multimedia-Center-Solution just for you and for modern Bars! You want hear a special Song and you don't know the right Album? Well, that's over now! Get the Jukebox and put your whole music collection to a single PC with included CD-Ripper! Designed for easily searching and exploring for Albums, Artists and Songs supported with graphics to discover.Use the Playlist Generator and your mood to settle the music to play with a few clicks! 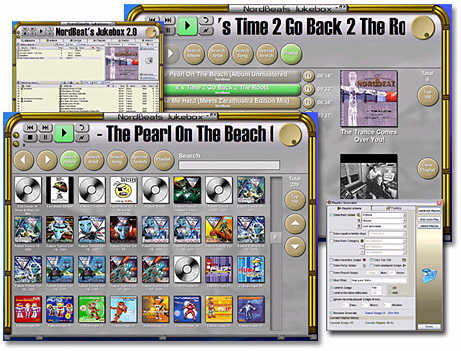 NordBeat's Jukebox is Shareware, this means, you can manage and hold about 100 Songs (ca. 6-8 Albums) with unregistered version only, but you can use all functions without any limitations! Kiosk and Bar Mode to prevent unwanted deletions and modifications of songs in your bar and of course to use the Jukebox with a Touchscreen Monitor! Multi instance Smart CD-Ripper to easily rip and encode (in the background) your whole CD collection to the Jukebox. You have three CD-Rom devices? Use all at the same time! WebInterface Administration to remote control several Jukeboxes in your household or Pub with a simple Web browser. Report Generator to generate reports to the HTML format. You can define your own templates! Song and Artists Playlist limit mechanisms to prevent adding same Songs/Artist songs multiple times to playlist. db Script Editor Need more functionality in your Jukebox? Go ahead with the db Script editor, to write your own scripts to organize and manage the sound files. Song Editor to edit and tag all your sound files (MP3 and OGG). Organizing Functions You can create folder structures of your Song files on the hard disk directly! Choose your new desired file name format of your sound files on the hard disk. Shortcut Generator Now you can create various shortcut-collections to link your sound files! No need to move or organize all your sound files! Peer-2-Peer Console: The sharing Tool for sharing your Songs with your friends in a private P2P Network! X2CD Music CD Burner - burn audio and MP3 CDs. Convert audio files.